W. Hodding Carter was an NCAA Division III All-American and a national champion on his college swim team. He is a contributing writer for Outside magazine, has written for Esquire and Gourmet, and is the author of five previous books of nonfiction. he lives with his family in Rockport, Maine. Hodding Carter dreamed of being an Olympian as a kid. He worshipped Mark Spitz, swam his heart out, and just missed qualifying for the Olympic trials in swimming as a college senior. Although he didn't qualify for the 1976, 1980, 1984, 1988, 1992, 1996, 2000, or 2004 Olympics, he never stopped believing he could make it. And despite past failures and the passage of time, Carter began his quest once more at the age of forty-two. Maybe he's crazy. But then again, maybe he's onto something. He entered the Masters Championships. He swam three to four miles each day, six days a week. He pumped iron, trained with former Olympians, and consulted with swimming gurus and medical researchers who taught him that the body doesn't have to age. He swam with sharks (inadvertently) in the Virgin Islands, suffered hypothermia in a relay around Manhattan, and put on fifteen pounds of muscle. Amazingly, he discovered that his heartbeat could keep pace with the best of the younger swimmers'. And each day he felt stronger, swam faster, and became more convinced that he wasn't crazy. This outrageous, courageous chronicle is much more than Carter's race with time to make it to the Olympics. It's the exhilarating story of a man who rebels against middle age the only way he can—by chasing a dream. His article in Outside magazine, on which this book is based, was the winner of a Lowell Thomas award from the Society of American Travel Writers Foundation. "Off the Deep End is hilarious and insightful. It's far more than a book about swimming. Carter's story will inspire people to go for their dreams at any age, and you can never get enough of that. I love this book!" "The unsung hero of human history was, of course, the Brain of Drains, the Hub of Tubs, the Power of Showers, the Brewer of Sewers...the humble plumber." When we consider the amenities that really make a difference in our well-being, surely good plumbing must rank near the top. But rarely have we taken the time to appreciate the engineering marvels that bring clean water into our homes with the turn of a tap and the flip of a lever. Until now. 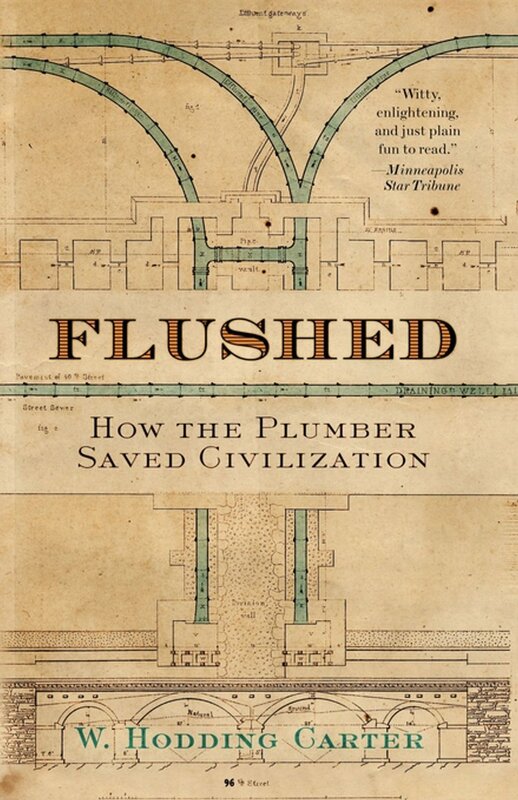 Witty, anecdotal, and thoroughly entertaining, Flushed chronicles the long and notable history of plumbing, while following Hodding Carter's travels and travails around the most underappreciated pillar of civilization. It's a winning combination of history, science, and firsthand experience -- a book that will both entertain and educate those who have never contemplated the hidden intricacies of this miracle of everyday technology. A riotous journey through America's most controversial, beautifully unapproachable, and abused wilderness -- the Florida Everglades. In December 2000, President Clinton signed into law a $7.8 billion restoration plan for the Everglades that garnered national attention and has since become America's touchstone for environmental issues. Enter W. Hodding Carter, a man already bemused by the state of Florida and determined to see what, if any, progress has been made with the Everglades. For reasons unclear even to him, this amazing, remote, mosquito-infested, hard-to-love region has captured Carter's imagination and won't let go. So, for the past few years, Carter has examined the Everglades from all angles -- social, political, cultural, environmental -- culminating in an ungodly canoe trip through the heart of the Everglades. But this being Hodding Carter—a man who sailed a Viking ship dressed in serge for one book and followed in the footsteps of Lewis and Clark for another—a canoe trip the length of the Everglades is merely the tip of the iceberg. Stolen Water finds him adopting a manatee, and auditioning to be a mermaid at Weeki Wachee Springs -- not enough that he reports on things, he actually has to do them, too, often to hilarious effect. In the end, though, his tireless reporting reveals the Everglades as never before. Not content with merely observing, he also interviews all the key players, from environmentalists to sugar farmers to Senator Bob Graham, and gives them just enough rope to hang themselves. Always humane, often controversial, and highly readable, Hodding Carter has brought to life this murky, alluring place through his powerful eyewitness account and swampy mishaps. Stolen Water is narrative nonfiction at its best, from one of our most talented and funny writers. W. Hodding Carter admits he cannot sail a Sunfish, hates to be cold, and panics when he's lost. So why did Carter devote three years of his adult life, not to mention a small fortune, to dodging polar bears and icebergs on an open-decked wooden ship resembling an over-sized canoe? He wanted to be a Viking. Obsessed since childhood with Leif Eriksson and his triumphant voyage a thousand years ago from Greenland to North America, Carter hatched the admittedly crazy idea of reenacting Erikson's voyage in a replica of the precarious square-rigged Viking cargo ship known as a knarr. Never mind that he had a wife, twin daughters, and another baby on the way. Carter was going to make it happen. This enthralling, inspiring, occasionally hair-raising, and genuinely hilarious book is the account of how he pulled it off. With funding from Lands' End and expertise gleaned from Viking enthusiasts all over the world, Carter had the knarr constructed by an eccentric boat builder on a small Maine island. He then arranged to have the Snorri, as he dubbed the craft, shipped to the southern tip of Greenland, where he and his grab-bag crew of eleven would embark in midsummer. The departure was inauspicious, to say the least: for two solid weeks, the Snorri tacked back and forth in the windy fjord by Erik the Red's ancient farm, covering a grand total of eighty miles. Although that first attempt ended in defeat in the middle of the Davis Strait, Carter, his prudent red-haired captain, and their crew were not about to surrender. The next summer, in even worse weather, the Snorri was back on course and these latter-day Vikings were ready to handle anything Mother Nature dished out atop the icy, open sea. By turns thrilling and slapstick, sublime and outrageous, A Viking Voyage is an unforgettable adventure story that will take you to the heart of the most magnificent, unspoiled territory on earth, and even deeper, to the heart of a journey like no other. A celebration of the people and places Carter visits and a treasure-trove of fascinating Viking lore, this is a mesmerizing story of friendship and teamwork--and of accomplishing a goal that once seemed impossible.